We’d love your help. Let us know what’s wrong with this preview of The Radiant Midnight by Melissa Maimone. Through candid storytelling, biblical truth, honest lament, and unexpected humor, The Radiant Midnight is a bold refusal to simplify the experience of suffering by moving too quickly to try to relieve it. With questions to guide you and practical suggestions to lead you through dark moments, this book takes you on a journey of surrender, suffering, rest, and restoration as it encourages and comforts you in whatever struggle you face. To ask other readers questions about The Radiant Midnight, please sign up. The Radiant Midnight spoke to the depths of my soul in ways I was not aware possible. Writing about her own struggles with depression and anxiety from a young age, Melissa Maimone encourages others to see the darkness as an opportunity to grow. I chose this book based off of the title - perhaps my own struggles with anxiety led me to see something of value in it, and I have not been disappointed. Maimone's writing is raw and vulnerable. Reading her story I feel seen and heard and confirmed, knowi The Radiant Midnight spoke to the depths of my soul in ways I was not aware possible. Writing about her own struggles with depression and anxiety from a young age, Melissa Maimone encourages others to see the darkness as an opportunity to grow. I chose this book based off of the title - perhaps my own struggles with anxiety led me to see something of value in it, and I have not been disappointed. 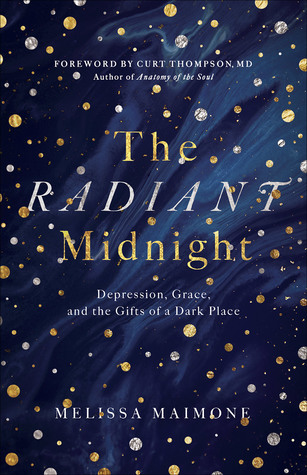 The Radiant Midnight is about the author’s continuing struggles with anxiety and depression and how her Christian faith has helped her to not only survive the dark times, but to recognize them as an opportunity to grow in her faith. The author’s willingness to be totally open about her struggles with the deep despair of midnight where darkness abounds, gives her authenticity and connects her to readers who are currently or have in the past been caught in the tight grip of depression, anxiety and/ The Radiant Midnight is about the author’s continuing struggles with anxiety and depression and how her Christian faith has helped her to not only survive the dark times, but to recognize them as an opportunity to grow in her faith. The author’s willingness to be totally open about her struggles with the deep despair of midnight where darkness abounds, gives her authenticity and connects her to readers who are currently or have in the past been caught in the tight grip of depression, anxiety and/or fear. There is an immediate sense that here is someone who understands, has been where you are several times, and not only made it through but grew from the experience. Each chapter ends with meaningful, to the point questions and exercises designed to help the reader understand the darkness and find their way out. This book is a perfect example of the power of vulnerability. If we are willing to be truly open, honest and vulnerable with others, amazing things can and will happen. Many people who are suffering will be helped by the words contained within these pages. I am so grateful that Melissa Maimone shared her journey and am already making a list of those I know who would find this book as meaningful and helpful as I have. Many thanks to NetGalley and Harvest House Publishers for allowing me to read an ARC of this book in exchange for an unbiased review. Opinions stated here are my own. Best book on depression ever! Every page a blessing. Words to hang onto in the darkest night of depression, anxiety and grief. A light in the darkness for all who suffer. Not self-help, but Christ-help. I highly recommend this book! !